machine head | The How-To Repository for the Cigar Box Guitar Movement! Traditionally, open-gear tuners have been used on acoustic guitars and sealed-gear tuners have been used on electric guitars. They do the same thing, but their appearance and methods of mounting differ. 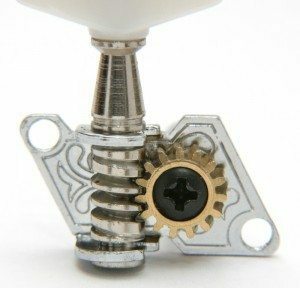 Open-gear tuners usually have at least two screws, and often utilize a press-fit bushing that mounts in the front of the headstock. Sealed-gear tuners usually have a threaded bushings that screws through the headstock into the tuner base plate. Choosing which to use is personal preference – both will serve equally well in most scenarios.